Capital One Venture Card Worth it? Miles rate and interest rates are balanced well. With current features of the card, if you are spending much regularly for hotels, Capital One Venture Card can be very beneficial for consumers. There is 50000 miles bonus for $3000 bonus. See the review section below for more information. 10x miles on purchases from hotels.com. 2x miles for all other purchases. No need to pay annual fee in first year. No extra payments in foreign transactions. Cash Advance and Balance Transfer fees are very good. There are many good and unique benefits of the card. Capital One Venture Card is a nice miles card that you can get 2x miles on every purchases and 10x on hotels.com purchases. We are going to provide a detailed review for each features of the card on this page. Since you need an excellent credit score to get this card, you can pay 25.24% APR for it maximum. This is actually very high for excellent credit score. Since there is not already any introductory APR, you will feel the highness of interest rates when you receive your first bill. We will make an calculation and compare rewards and expenditure to understand if this card worth it. Let’s see. Without Cash Advance & Balance Transfer. My monthly overall purchase is $1200. I go to vacation for 10 days in a year with my family to abroad. This year we are planning to go to Italy. I will pick a 4 stars hotel from Rome for 10 nights. Here: Radisson Blu es. Hotel. 2 adult and a child (2 year-old). 01.02.2018 price is $209. For ten nights I will pay $2090. I need to pay $25 for interest every month. I earn $24 worth miles every month from purchases. With Bonus in First Year: $58.16 profit monthly. With Annual Fee After a Year Later: $8.5 profit monthly. With Balance Transfer and Cash Advance. Purchase : I need to pay $25 monthly. Cash Advance: I need to pay $10.42 interest + $15 fee monthly. Balance Transfer: I need to pay $2 interest + $3 fee monthly. With Bonus in First Year: $27.75 profit monthly. With Annual Fee After a Year Later: $21.81 loss monthly. Consumers are generally lose at all rewards and expenditure compare of course. However $21.81 maximum lose with current rates is very good. If you need a hotel card and if you spend hotels for a few times in a year, Capital One Venture Card is going to be fully profitable for consumers. If you don’t also use this card for cash advance, it is also going to be very beneficial for consumers. Besides there is also $100 worth travel credit for you in Capital One Venture Card. We haven’t add it to our compare. You care going to earn 50000 bonus miles just after you spend $3000 in three months after account opening. 50000 miles worth $500 and it is really good bonus which will help you to book hotel rooms free. You are going to gain 10x miles from hotels.com purchases and you can gain 2x miles from all other purchases with Capital One Venture Card. 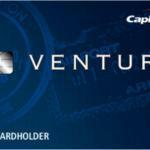 First year is waived for Capital One Venture Card. Then you will need to pay $95. This is very good for such a card which is providing high bonuses and rewards. If you go abroad or if you buy products from abroad with other currencies, you are not going to pay extra fees for foreign transaction. This is a very good feature for a hotel & travel card. 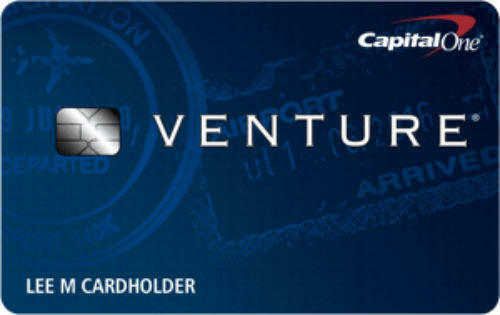 This is also another upsides of Capital One Venture Card. You are going to pay %3 maximum for your cash advance and balance transfer fee. This is also very good. These fees can be serious problem for consumers. Especially when you calculate all fees that you paid in a year. 3% is a good rate for Capital One Venture Card. 15.24%, 21.74% or 25.24% 10x miles on hotels.com purchases. 2x miles on purchases for all categories. 50000 bonus when you spend $3000 in first three months. First year is waived.